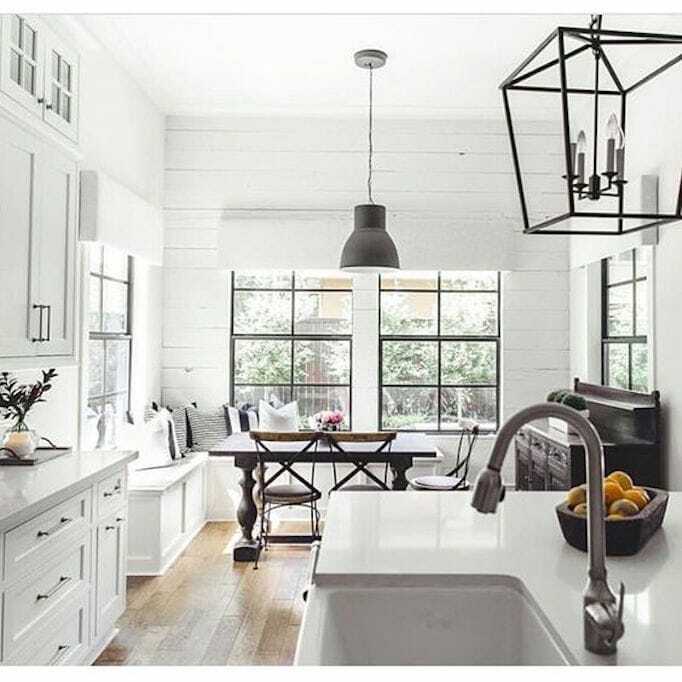 I’ve always gravitated to the crisp, clean match-up of black and white. I absolutely love it in fashion, having talked about it in both this post and this one. It’s a pairing that I wear all the time, and probably would wear every day if I could! 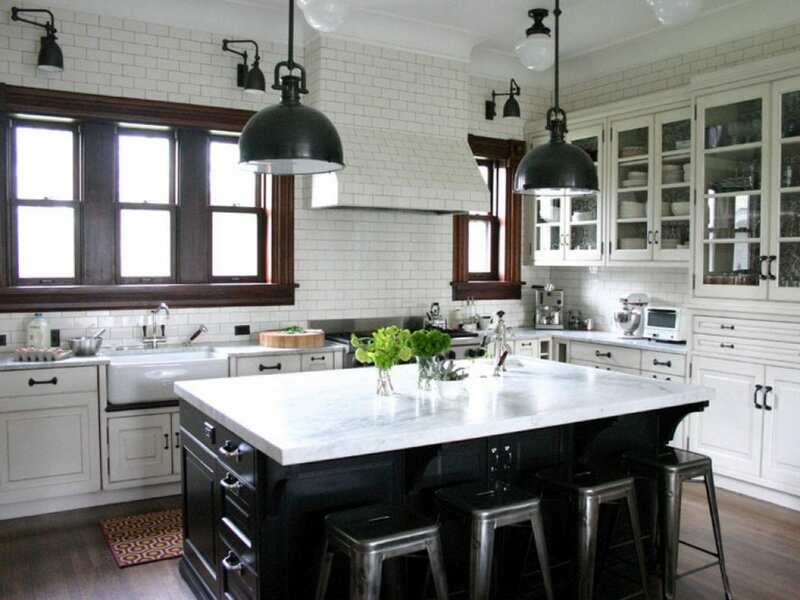 And now I find I’m gravitating to black and white kitchens, too. 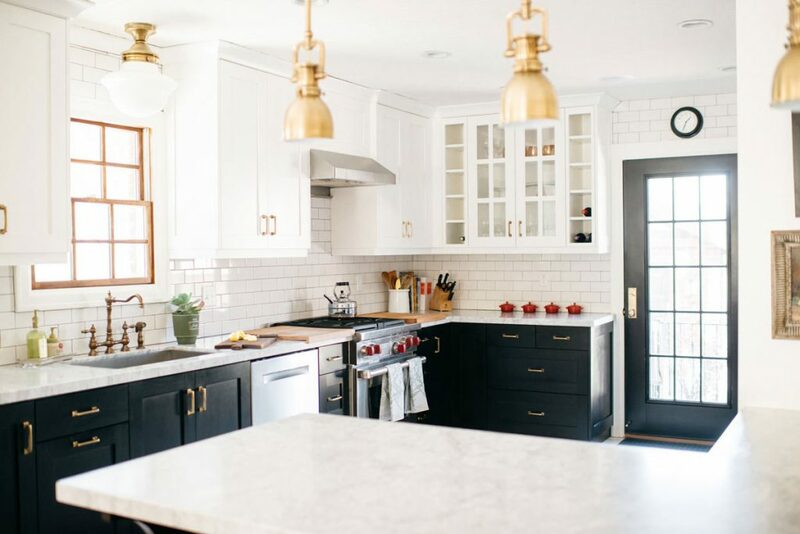 Maybe it’s having recently finished the renovation of this kitchen with touches of black that’s re-inspired my love for it. 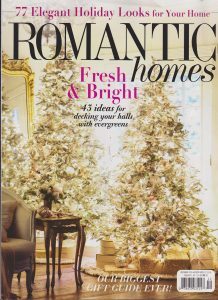 Or it could just be the fact that I’ve always loved it; I even decorated my first apartment in the combo. Whatever the reason, I’m definitely feeling an affinity for black and white kitchens these days! Of course, it’s still gotta have that white in there for me to love it! But I have to say, when you add some black into a predominantly white kitchen, it really brings it up a notch. There’s nothing like that crisp combo! It adds some much needed punch. It’s dressier. Kind of like a black tuxedo with a bright white shirt. 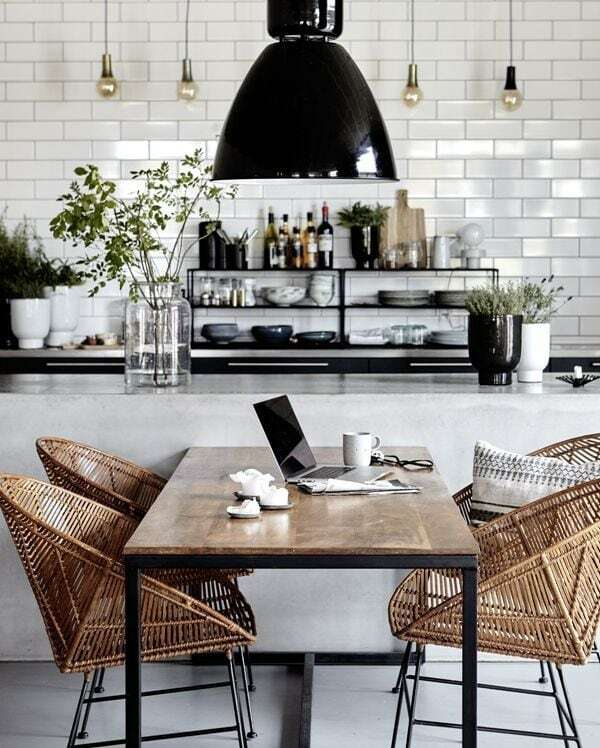 It’s a classic combination for a reason; think traditional French bistros with black and white floors and marble counters, or a New York loft apartment with lots of black and white photography. 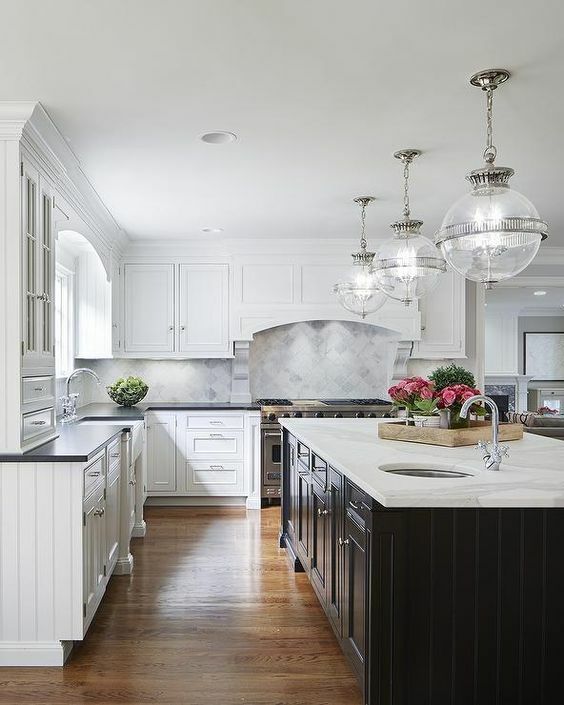 Black and white kitchens have a certain chicness, and to me, a touch of black is the perfect thing to add to a kitchen if all-white is too much “white” for you. And the brass fixtures and lighting that are all the rage right now? They look amazing in a black and white kitchen! 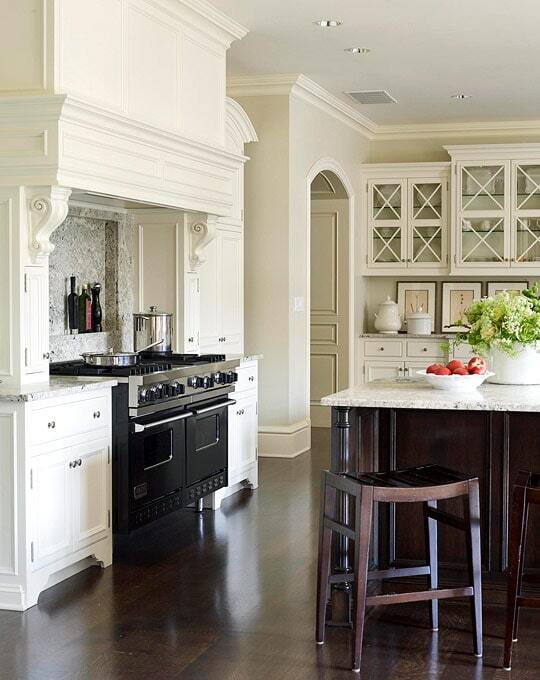 Stunning traditional kitchen via Traditional Home. This is just so timeless – and that lantern!! One of my favorite kitchens ever! 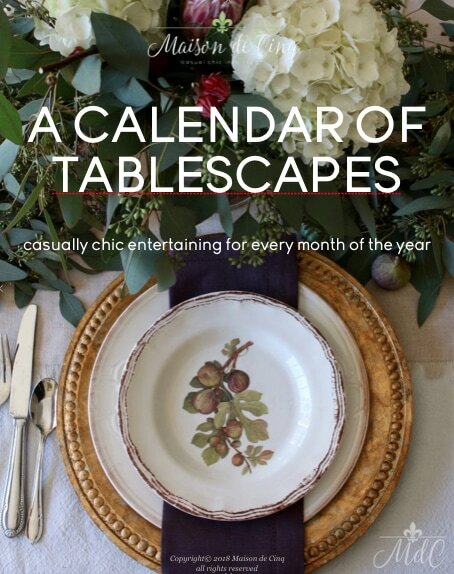 Suzanne Kasler via Traditional Home. 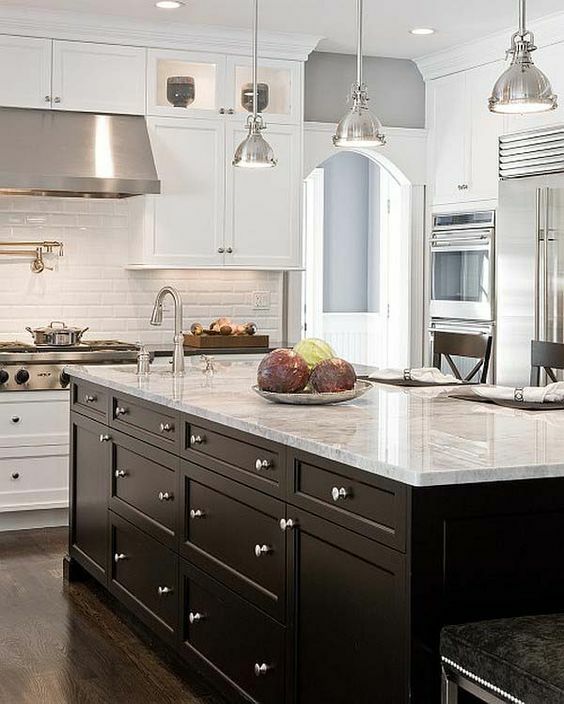 Love the hardware in this modern black and white kitchen by Elizabeth Lawson. Design by Martha O’Hara Interiors. Via Berkshire Hathaway Real Estate. Utterly charming! Via Zillow. Love the drama of that black range and hood!! 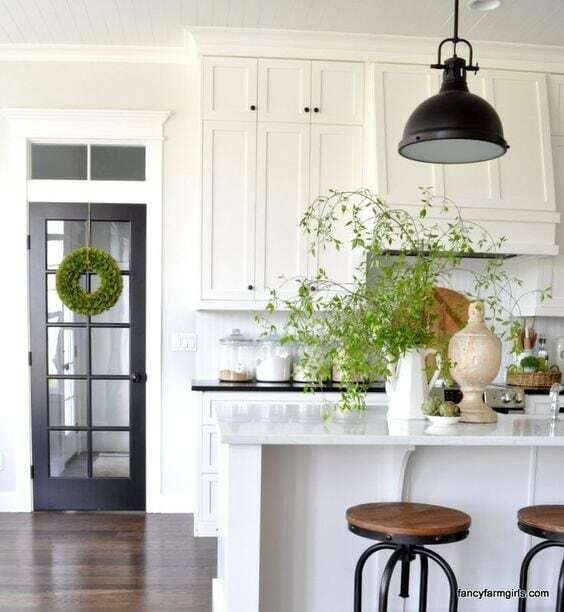 Love this adorable farmhouse kitchen with touches of black. From the blog Fancy Farm Girls. Via Allegiance Builders. Design by Venegas & Company. 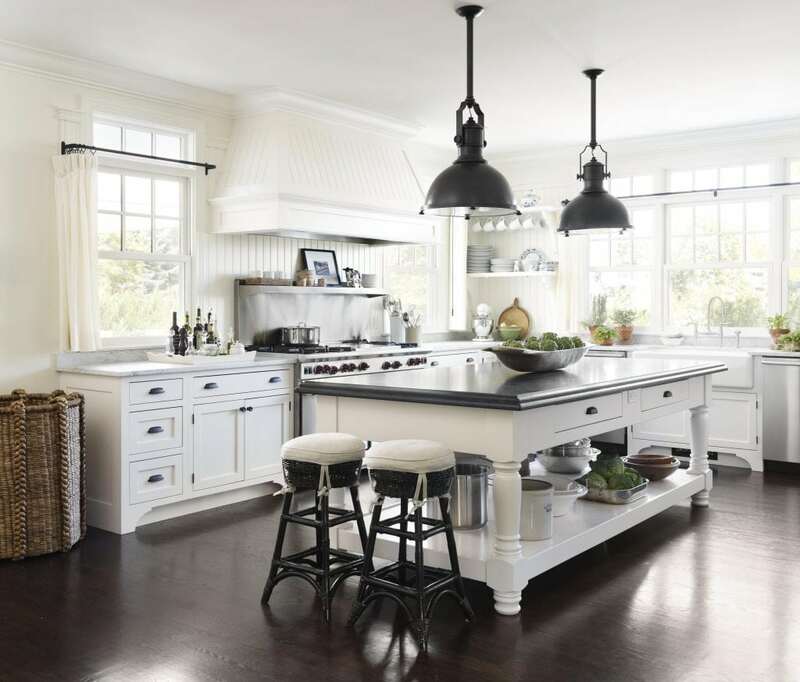 The black French doors in this kitchen make the room! 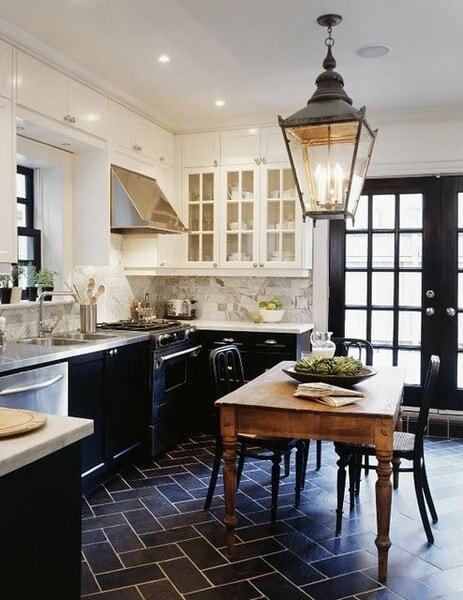 Loving the herringbone floors and the cute lantern, too. Designer Tommy Smythe. 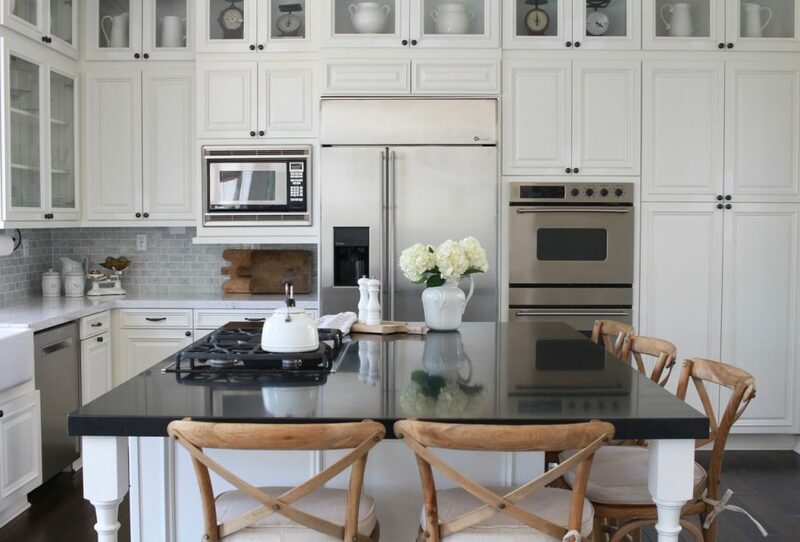 This gorgeous kitchen belongs to my blogging friend Tamra at Citrine Living. Love the black island and the lights! Via Luxe Interiors and Design. 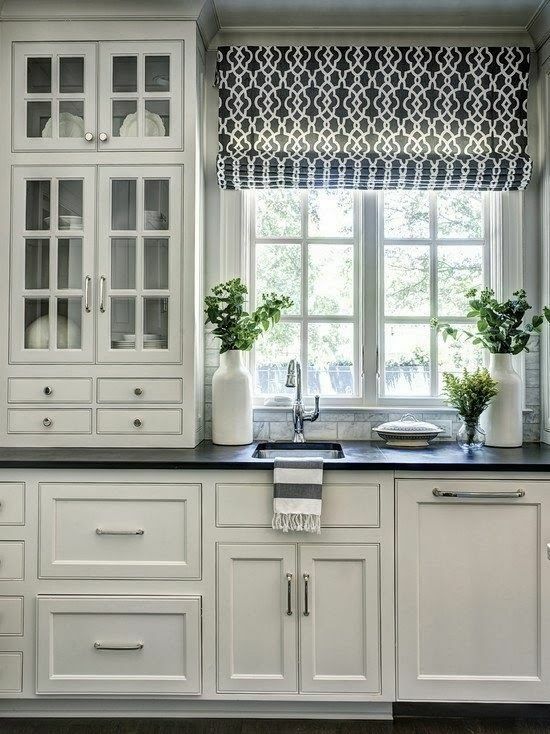 How cute is this roman shade in black and white?! Via Lyn Chalk Window Treatments. One of my favorite kitchens! I adore the “tuxedo” look of it, and that brass hardware! Via Lonny magazine. My first kitchen in my first house had these same floors! I have to admit, I do still love them. So charming and old-fashioned! Design by Kitchen Lab Interiors. I absolutely adore this kitchen! And the pendant lights are fabulous! Interior design by Angie Gren. Also, if you missed my post on the Farmhouse Kitchen Renovation that I revealed a couple weeks ago, here’s a peak at what we did. We combined black granite on the island and some black accents in an otherwise white kitchen, and we loved how it turned out! To read the full post and get all the details, click here. These are all great kitchen finds. 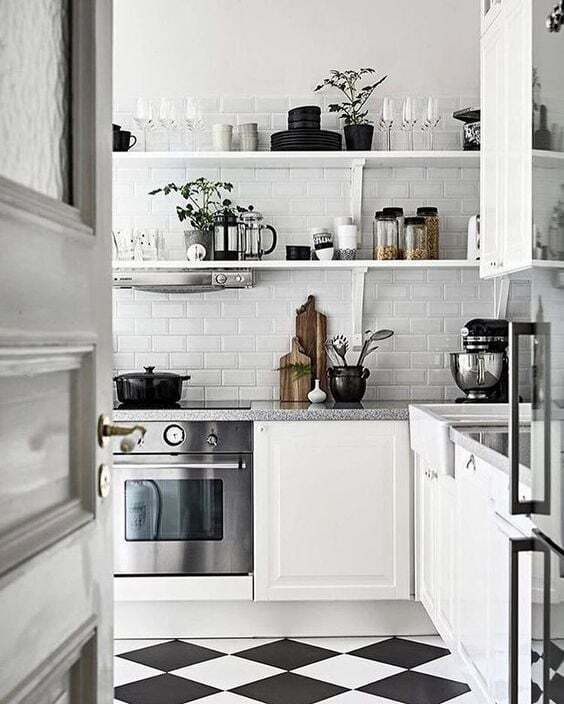 I’m seeing black and white kitchens everywhere. We are also seeing colorful cabinets too, like a deep blue or green. 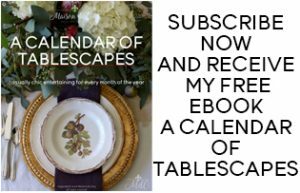 You shared some of my favorite kitchens – and a few I haven’t seen yet! Love the combination of black and white. 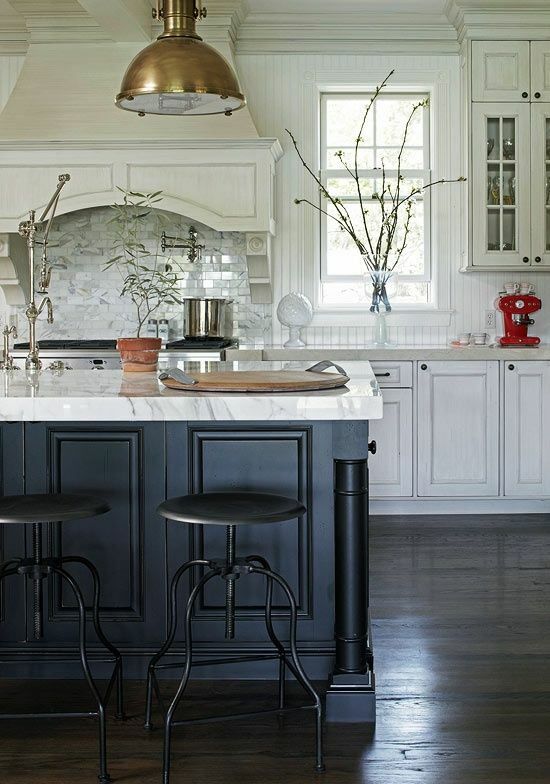 When we designed our kitchen, I went back and forth for awhile between wanting the island a stained color and having it painted black. We went with the stained in the end because we thought it would hold up better with boys – but I guess I always have the option to paint it in the future! Great inspiration, Sheila! Enjoy your weekend! 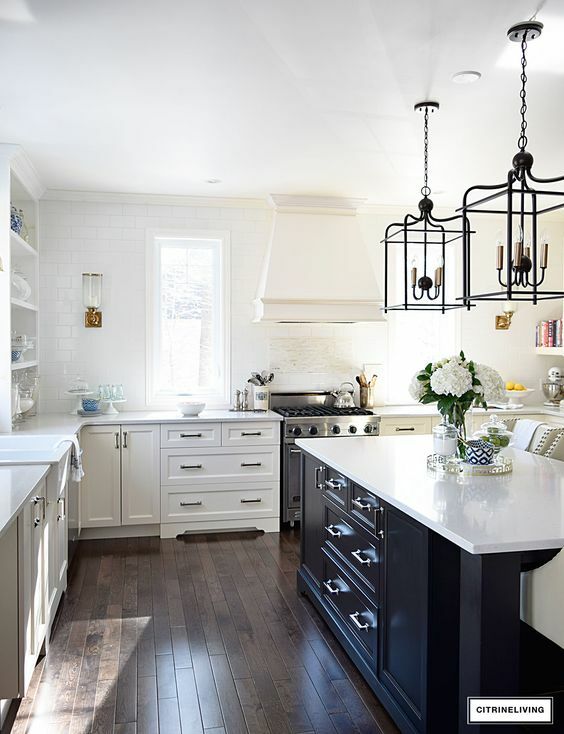 I didn’t realize you had been considering a black island – it would look so cute in your kitchen! And yes, I think you can always paint it when you want a change! Thanks for popping over my friend – and Happy Weekend!